Salamanca is probably best known for having the oldest university in Spain and one of the oldest in Europe. This university is still what gives ambiance to the town. You can see hundreds of students passing through the streets and enjoying numerous and beautifully decorated bars until late at night. This charming town is untouched in it's architectural purity. In central areas all recent buildings are constructed in Salamanca's best tradition. The city has been declared a "World Heritage Site" by UNESCO. The city is large enough (180.000 inhabitants) to be able to offer the advantages of a real city, but at the same time it keeps the intimacy of a village. In Salamanca, the inhabitants speak the "purest" Spanish in Spain - Castilian. 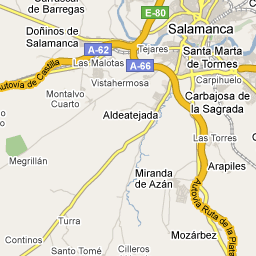 For this reason Salamanca is enormously popular with people all over the world who want to learn Spanish. Contacts are made easily. You don't have to make rendezvous as you are bound to see everyone in the Plaza Mayor, one of the finest squares in Spain and known as the living room of the Salamantinos. As there is such a varied range of nationalities, it is tempting to keep to fellow don Quixote students. Salamanca is however, a real university city, Spanish students are everywhere and you can go practically everywhere on foot. On August, 15th you may visit La Alberca, where the Ofertorio takes place, a celebration in honour of the Holy Virgin, which is of particular interest to the tourist for its folklorist style and the regional dresses. Salamanca's cathedral is a prototypical example of plateresque style which is so typical for Spain, marking the transition from Gothic to Renaissance. Spaniards call this cathedral "La Nueva", the new one, as the old cathedral still exists at its side. In its splendid interior pay attention to the "Golden Chapel" with extraordinary works of sculpture and to the Patio Chico, the small yard, to be found at the place where "old" and "new" cathedral are built together. A narrow street, Calle Calderón, leads you from here to the University quarter. Hardly another town offers such a vibrant nightlife as Salamanca, and the students of this old University town confirm that its great luck to study here. "Ir de pinchos" means to "go out" in Salamanca, as in many of the bars you are offered a free snack, "pincho", whenever you ask for a drink - specially surprising, as prices are really adapted to a student's money-bag. At a later hour you may want to check out one of the many discotheques, where the party continues until the morning arrives. The people of Salamanca know, why they say about their town: "Salamanca por la noche como ninguna", there is nothing like Salamanca for nightlife.